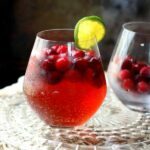 A pretty holiday cocktail, the cranberry Moscow Mule is spicy, sparkling, and delicious! So easy to make -- you'll love this as much when you entertain as you will when relaxing with a friend. Mix the vodka, cranberry cocktail, lime juice, and cracked ice in a shaker. Shake until the shaker is icy cold and frosty. Add the cranberries and lime wedges to garnish.